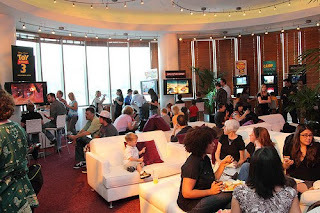 Disney Interactive Game Night Was A HIT! Last week, Aubrey and I had the opportunity to attend the Disney Interactive Game Night at Hollywood and Highland. 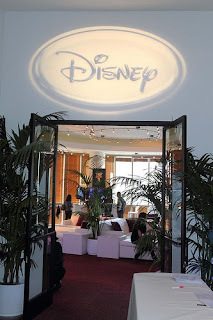 Disney always throws a classy, family friendly shindig, and this party was no exception. 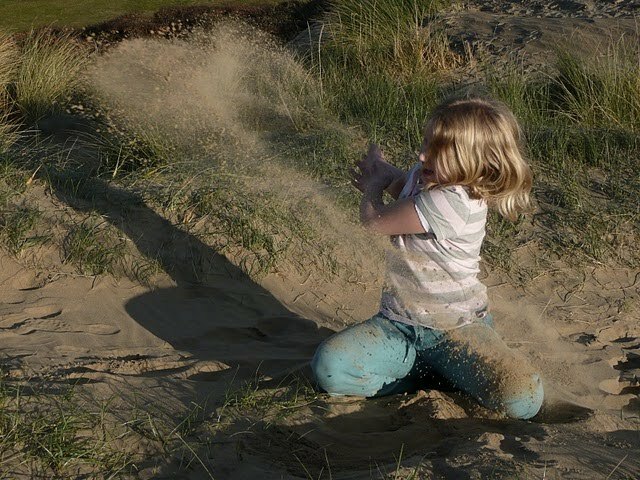 Aubrey is going to be three in two weeks and I went alone with her, so I spent a lot of the time wrangling her rather than playing games, but what we did experience, we really loved! Also, Aubrey is just below the target age for many of these family games, so we haven’t gotten into gaming at home yet (I’m still bragging about “flipping” our home version of Atari Asteroids when I was in third grade), but it’s good to know Disney is making some quality family games. 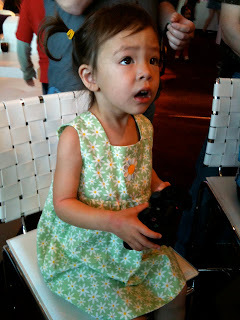 Since Aubrey doesn’t really know what video games are yet, I told her we were going to a “special party” by Disney. She kept asking if Mickey Mouse was going to be there so I was worried she might be a little disappointed to find out it wasn’t a Mouse party, but I was wrong. She had a blast! 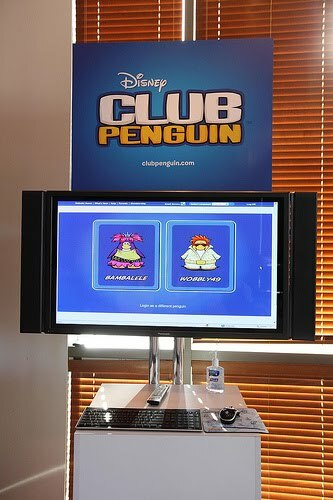 The first game we checked out was the oh-so popular Club Penguin. Every parent and kid on the planet seems to know more about Club Penguin than I do so I thought I should see what all the excitement it all about. It was really cute and I can see how kids get hooked on it. We had fun just picking out outfits for our penguin! 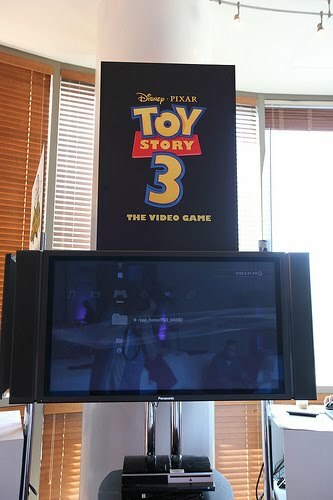 Next we tried Toy Story Mania. 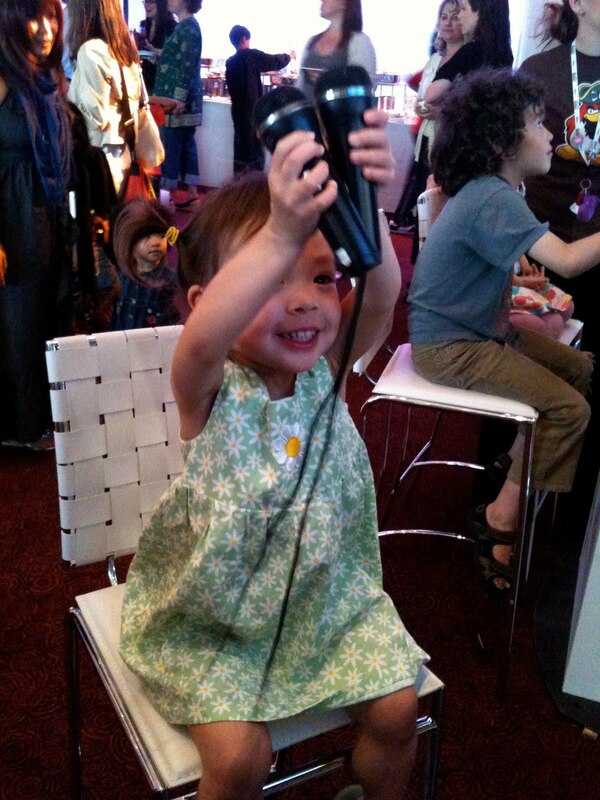 OK, let me amend that… AUBREY tried Toy Story Mania. I think I mentioned that the last video games I played were the Atari classics – Tank, Pitfall, Pong. I am really bad at modern video games – mainly because they make me a little dizzy and motion sick and I can’t figure out the controls. It’s a good thing that my almost 3 year old picked up the controller for Toy Story Mania and figured out how to make Jessie the Cowgirl jump on and off her horse and ride all over the screen! Even the guy demoing the game for us was a little surprised. Kids! Aubrey is currently horse obsessed after visiting relatives with horses last month, so this game was a real hit for her! I can’t wait to take her to Toy Story 3 later in June! The third and final game we played was definitely our favorite – Sing It: Family Hits. 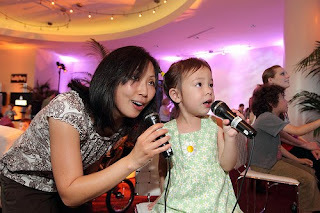 All of my favorite Disney family movie songs (Supercalifragilis, Winnie The Pooh, Kiss The Girl…) in karaoke mode! For a woman who makes her living on stage with a microphone and her kid who is a bigger ham than her, this game was a blast. I couldn’t get Aubrey away so I can imagine a game like this may easily be in our future. Just before we left, we caught a glimpse of an iPad demo of some of the cool Disney Interactive apps. 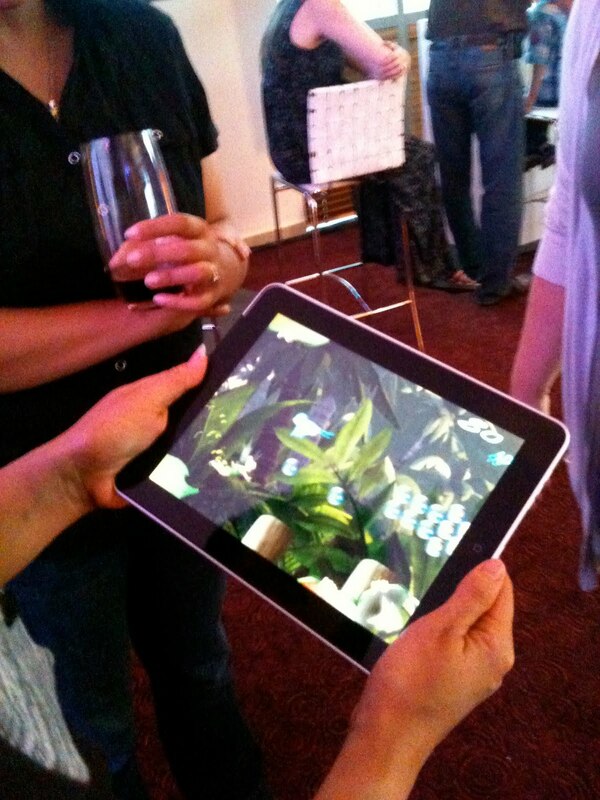 The games looked really cool, but I have to admit I was just excited to touch an iPad…. oooooohhhhh! I should mention that there were MANY more games that we didn’t get to. Titles like Phineas and Ferb, Split Second, Toon Town, Cars, Guilty Party, Pixie Hollow and more were all there and everyone seemed to be having fun. 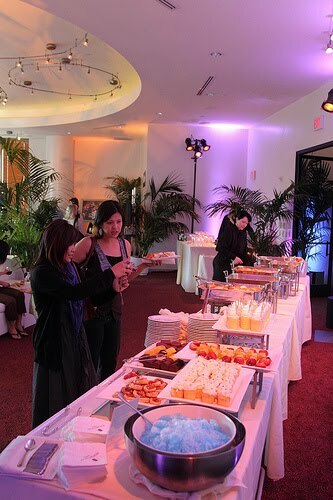 Of course, it wouldn’t be a complete Disney party without awesome, family friendly food. Disney is great at putting together buffets that are gourmet versions of things kids love to eat, so the adults are in food heaven too. The buffet included cheeseburger and shrimp po’ boy sliders, onion rings, French fries, fruit kabobs, hummus, wraps, quesadillas and more but the best part was the desserts which included home made ho hos, ding dongs and twinkies that were out of this world. The banana pudding and apple pastries were great too and the kids were all over the Club Penguin snow cones. Overall, it was a great night and it was such a treat to be able to share it with my daughter. She really had fun and is still talking about the “special party”. Thank you Disney Interactive for a special night together! Summer With Fresh and Easy! My display of Fresh & Easy YUM! I LOVE it when I get a new Fresh & Easy delivery to my po box. I know there’s some awesome stuff inside and, of course, I get to brag about it and share the info with my friends. Then, I get to EAT it!! The fine folks at Fresh and Easy are helping us get ready for all those summer barbecues with grill packs, chips, buns, condiments, cookies, booze and more! YEAH! For under $10, grab a ready-to-throw-on-the-grill “Grill Pack” that includes nearly five pounds of hamburgers, chili-seasonsed chicken and Italian sausages. Top them off with the basics like Fresh and Easy’s organic ketchup, yellow mustard or Original BBQ Sauce, all for under $3 each! Then toss your meaty McMeaterson on a Gourmet Wheat Hamburger Bun ($2.99) – baked daily at Il Fornaio, btw – and grab a handful of F&E Malt Vinegar & Sea Salt Kettle Chips and VOILA!!!! You have some serious kind of yum for social noshing. Aubrey’s a fan of Fresh & Easy! I also got a small vat of F&E Soft Cranberry Oatmeal Cookies with Walnuts ($2.99) and a bottle of The Vine Yard Pinot Gris ($6.99). I have yet to crack the bottle of wine and the cookies were ok, but I have to say the Malt Vinegar & Sea Salt Kettle Chips ($1.49) are some of the best I’ve ever had. You can really taste the malt flavor of the vinegar and they have just the right amount of tangy bite. 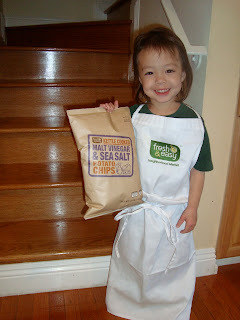 Surprisingly, my 3 year old daughter even loved them, so we have another new favorite to add to our F&E list of loves! As usual, I can never say enough about Fresh & Easy. They are absolutely, hands down, my favorite grocery store on the planet and I can’t wait for them to expand around the US so more of my friends and family can experience the love. For those of you lucky enough to be here in SoCal, Fresh and Easy is partnering with award winning Grill Expert Neil Strawder (aka Bigmista) at four of their store locations to kick off the grilling season with special grilling tips and recipes and the first 100 people will receive a free reusable bag! Love The Mom, Hate The Kid?